Google demonstrated its Android operating system again, this time at the I/O conference in San Francisco. And, well, it’s still full of promise, just in case you were wondering. As you would expect from the company that brings you search and Google Maps, Android handles information delivery, location and navigation extremely well — or so we think. There’s still no actual Android phones to play with. The coolest feature shown was a “compass” tool that automatically roams with the phone while a user looks at photos of a city map. But the rest of what was shown was, well, underwhelming or just plain expected. Android, of course, has the option to use a touch screen. One feature allows people to swipe a finger in a user-defined pattern to unlock the phone, rather than a single left-to-right swipe across the screen on the iPhone. Added security, maybe, but potentially frustrating if poorly implemented. There’s a status bar that shows missed calls, appointments, and emails. OK, but nothing to get overly excited about. You can add shortcuts to the home screen, but users can already do that on the iPhone. Only Android takes it a little further by letting people add shortcuts for music or contact lists. No biggie. There’s a magnifying tool to zoom in on Web content. But is it cooler than you-know-who’s pinch motion for zooming in and out of Web pages? 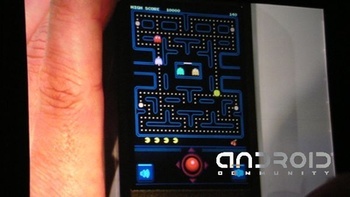 And there’s a mobile version of Pac Man. No comment. What was odd about some of the comments coming out of the brief Android demo was that some Google officials seemed to distance Android phones from the iPhone before they’ve even available. Gphones are not due out until the second half of 2008, most likely toward the end of the year. Naturally, Gphones will be closely compared by the tech community and users to Apple’s phone. Vic Gundotra, Google’s engineering vice president, told InfoWorld that Android does not represent Google’s countermove against the iPhone. This might be the fork in the road where Google separates itself from the iPhone. Why follow that same path? Google clearly hopes to cultivate its own services — particularly location, maps, and navigation — as well as Gmail, Gtalk, Google office, search, and advertising to people on the go. We really won’t know how disruptive Android-powered phones will be until all the players come together — Google, Android, hardware manufacturers, and software developers. That’s the demo we’re waiting to see. The comparison between Android and the iPhone is unfair. The iPhone, with all its glorious UI experience, is a very closed and tightly controlled platform. The promise of Android is not a better user experience but rather an open experience – the sort of stuff that the mobile web really requires at this stage. That’s a fair point, but in terms of UI and the Web browser (WebKit), the two platforms have a lot of common ground, so comparisons are inevitable. Let’s see how open the iPhone actually feels to end consumers, and what restrictions carriers / handset manufacturers put on so-called Gphones — they will be free to alter the Android experience as they please, so it could lead to a lot of fragmentation, leading to mixed user experiences and expectations. Also, my view differs slightly from Dan’s: I think Android is looking pretty nice and, together with Apple, will really get others to raise their UI game (looking at you Nokia), and that’s good for us all.